Okay fellow Con-geekthusiasts, it’s time to plan your 2018 Convention Schedule. Here are the Con Guy’s top 10 U.S.-based conventions, as determined by size and influence. 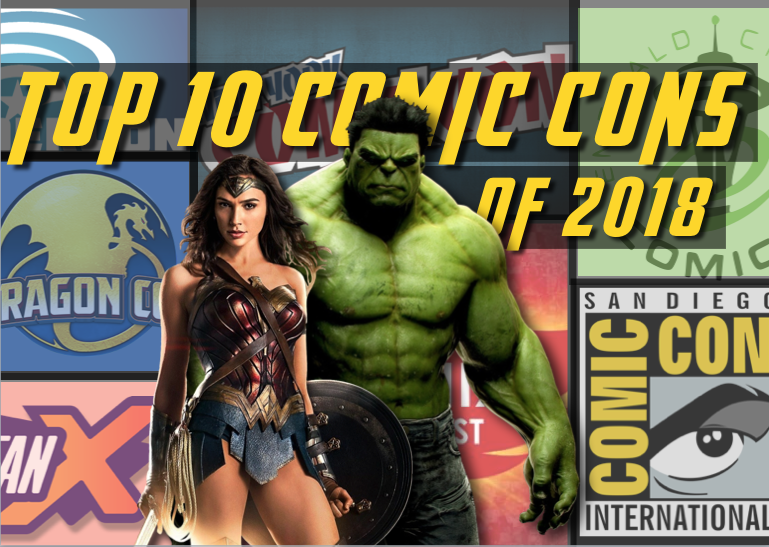 But first, we invite you to check out the Con Guy Comic-Con Prep Show where we break down this list. Check it out right here! We’re not saying these are the 10 best conventions — although that might be the case — but these are the 10 conventions that make the biggest blip on the cultural radar right now. You can click on each item below to find out more information. Some are already sold out (San Diego), whereas others are filling fast. And some are changing their names because of the recent legal developments regarding the name “Comic-Con.” Regardless, check out the list and make your choices now — it’s gonna be one awesome 2018. Not sure Salt Lake would even try to claim 100K anymore, they have gone downhill as their event has become basically a glorified Wizard World event. They maybe hit 70K over 3 days last fall, maybe. They didn’t sell out any of their badges, except maybe a VIP. If you want it to be a kids con.. then Salt Lame is the way to go.. The dominant religious belief in that area has made censorship run rampant.. Leave it to them to put a muzzle on awesome panelists like Bruce Campbell..